Discussion in 'News & Announcements' started by Georg Ortner, Jan 24, 2019. Last but not least, we present you the Porsche teams of ADAC GT Masters 2018.
great shot … reality or "just" a sim? ... A very good example why high detailed track objects are so important for the track development. The R3E Sachsenring is one of the best beauties in this case. ... A very good example why high detailed track objects are so important for the track development. The R3E Sachsenring is one of the best beauties in this case. Have you measured the dimensions and the living space of that building?! Joking aside, I love the Sachsenring too. Yeah, The UFO with Godehardt and Lucci Luhr on the steering wheel. Really cool Team. Glad to see it, because it looks awesome. Love the content from this patch so far! Will we also get a rule preset for GTM season 2018? This isn't necessarily a complaint, I'm more looking for insight towards S3 thought process on this. Back in '14 and '15 we had the ADAC packs/experiences. I thought with the dissolving of the experiences (which was smart as it fragmented the game), we had moved past this approach. 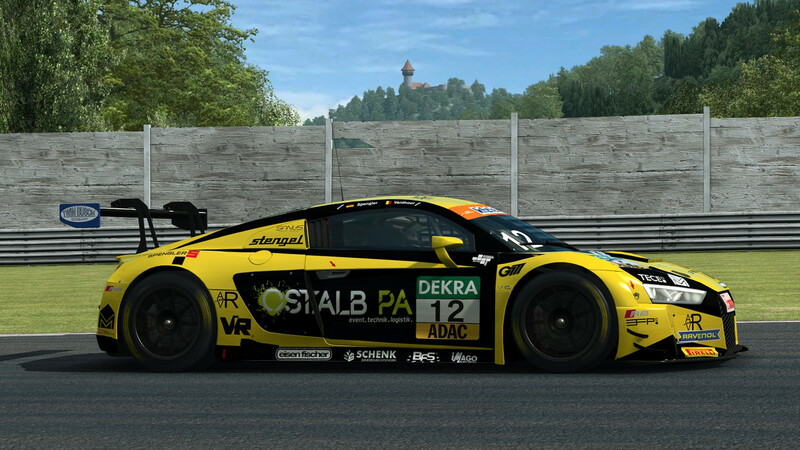 I had purchased the ADAC14 and the full GT3 pack, but my old ADAC cars are not 'in' the GT3 class. What I'm confused about is this pack seems to again start a fragmentation and the only benefit is new liveries, which, while cool, are not necessary. You guys have put a lot of work into the GT3 class over the past 1-2 years and its been great with all the new cars/liveries (of course many are missing, thats not my point now). Running a GT3 race I will not see these liveries, and running an ADAC'18 race, I will not see the GT3 liveries (although with the new awesome AI selector this is less an issue). If these liveries were super easy to knock out, then I understand, but I imagine the art designers worked hard on these. I'm super excited about the ability to change car settings after resetting a race (yes!) but I really don't understand putting this much effort into essentially a livery pack, when we have so many GT3s and nice liveries already. Again, maybe my whole complaint is moot due to the AI selector? Is a pack like this a necessary addition to compliment your ongoing live racing series/competitions/etc? I see a lot of that lately; it doesn't apply or appeal to me, but I understand things need to be done to further business. Just looking for some insight. Keep up the good work! It certainly helps when running an ADAC GT Masters Championship that the liveries are current and not from the 2015 season. Well, you can mix up GTR3 Class and GT Masters Classes with the AI Selector according to your taste. Since they have the same performance index in the background they are treated like one (performance-)class altogether. So? Where is the sense of bringing uncomplete ADAC Masters Grid without Acura, Lambo and Ferrari? If they can't get the licenses they require from certain manufacturers, they should just give up and not bother releasing anything then? That would leave most racing sims very, very short on content. Plenty of people are enjoying the cars available even without the other brands, so it's more than worthwhile and makes perfect sense. Or ACC telling us now: Sorry, no Aston, no Acura and no Bentley Gen2 in the final release. Sorry, thats a big joke and branding it as "GT Masters 2018" is a sass. People who believe in the title (like me on my brands purchase) will sit with wide open eyes, after starting a race...i was not able to find a hint, that there cars missing on the pack offer. They just put some new stickers on already purchased cars and sell it as something that it isnt: The GT MAsters Series 2018...lol...unbelivable. I kind of understand both sides: The pack is surely worthwile and is great to have rather than not, but people is upset because they don't get what's on the tab. You can't label this nonchalantly "ADAC GT Master 2018"... this will disappoint, upset and frustrate people, don't you know? "ADAC GT Master 2018 Liveries Pack" would have save you a lot of anger (at least a bit of them ). This is for my understandings a further sign, that the Man in charge of the Marketings at S3 is a miscast. so what will this cost the end user ?